In California, of course, the real politicians found a reason for action in Pluto’s demotion. While there are many more serious problems–over crowded schools and universities, decayed freeways, and the health care crisis, just to name a few—fifty-four of our esteemed elected officials found the time and energy for a Resolution that supports Pluto’s status as a full-fledged planet. They call the IAU “mean-spirited” for dissing Pluto, and that’s just the start. Hey, I’m all for Pluto being a planet and hopefully this legislation was just in good spirits, but com’n, hasn’t the Governator given you enough serious stuff to consider on the agenda? 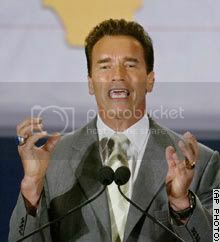 We need you to be putting out meaningful legilslation, Arnold is up for reelection!